As I made those morning facebook rounds, aside from my Louisiana friends who cannot be convinced I’m not an Istrouma High School graduate, the general topic of the day was Ferguson, Missouri. If you are unaware of the current racial unrest there, I would encourage you to give Google your best shot. 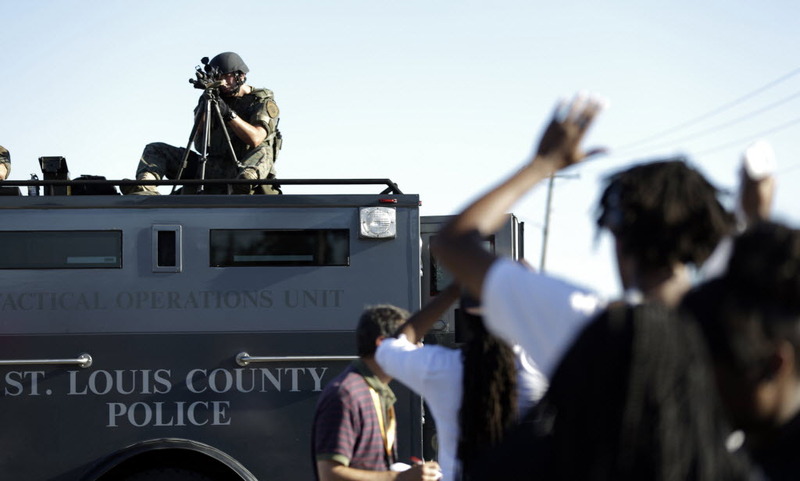 And while I’m certainly not sayin’ there was a holier than thou gestalt to the posts decrying the ongoing actions of the Ferguson Police, I will say there was a slightly superior sense of this kind of thing being relegated to a redneck state like Missouri. Maybe what we’re really talking about is a matter of degree here – at least Kane County police officers aren’t gunning down unarmed minorities in the street. But before you start believing those regular Fox News reports proclaiming the death of American racism, you might want to consider this. And yes! I’m gonna pick on the Tri-Cities again because I have far more first hand experience in that area, they have a statistically significant population, and they’re about as white as it gets. Using the 2013 Illinois Traffic Stop Study and the 2010 census data, the good news is the St. Charles PD pulls over minorities at a rate perfectly proportionate to their population – about 15 percent. The Batavia and Geneva police departments? They both stop minorities twice as often as you’d expect. But that doesn’t look as bad as it should because, by whatever formula the study uses, it allows all Kane County cities (except Aurora and Elgin) to claim a 36 percent minority driving population. Now, I don’t know about you, but by sheer unscientific observation, I can tell you with calm certainty that one out of every three Randall Road drivers ain’t black or Hispanic – and that’s a main artery. It’s a lot more along the lines of 1 in 20. So clearly, the rest of the county’s getting the Aurora/Elgin benefit of the doubt. But the rubber really hits the road when you compare who gets more citations. Though they’re better than the other two, this is where St. Charles falls off the impartiality wagon. A minority motorist stopped there stands a 42 percent greater chance of driving away with a ticket. Those odds improve to 55 percent in Batavia, and Geneva writes up Hispanic and Black drivers more than twice as often as Caucasians. So it should come as no surprise that, if you’ve ever had the misfortune of receiving an invitation to the Tri-Cities court call in the Circuit Clerk’s building, 40 to 50 percent of the attendees are minorities. And I’ve seen you white folks drive! The real irony is that Elgin’s, and especially Aurora’s, numbers are much more in line with what you’d expect. It’s rare to see anyone pulled over on the sidewalks or side streets of our Geneva subdivision, but when it does happen, you can bet your bottom dollar it’s bound to be a minority. And that means someone had to call it in. We do get our share of overly-aggressive door-to-door salespeople, but I’ve also heard some interesting comments about the minority folks who are courteous and respectful. Some of my neighbors have also found an interesting use for sidewalk chalk! To be fair, it all started with some anti-semitic ramblings, so apparently some of ‘em take issue with the wrong kind of white folks too. But last summer they moved on to musings of a more racial nature which I will not repeat here. But this one is my absolute favorite. Having parked across the street from the Geneva Post Office, I noticed a rather confused looking young African-American gentleman. Perhaps this is my own version of racism, but since you don’t see too many black people wandering down Third Street, I quickly surmised he was at the wrong courthouse. Given my eminently shy nature and the fact that Genevans don’t truly appreciate wandering minorities, I asked if I could help. He said the taxi driver dropped him off at the Kane County Courthouse, but this didn’t seem to be the building. I explained this was the civil court and the one he wanted was a bit further west. Dismayed, he asked about any busses and while theorizing there must be some Route 38 route, I realized my convoluted explanation would take far longer than simply driving him out there. Now, I am not a person of any great virtue – just ask my wife (and some of my readers) – but, as the young man got into my car, I will never forget the horrified looks on the faces of the people who’d paused to eavesdrop. So before we consign all those heinous racist tendencies to Ferguson, perhaps we can use this opportunity to consider our own evolution and whether we’ve really come as far in this regard as we think we have. It would be the Christian thing to do. ← Politically, Kane County’s actually got it pretty good! . . I’m sorry . . “the christian thing to do” seems to be, being Homophobic, Xenophobic, Sexist, Racist, Judgmental, Intolerant and Hateful . . .
Before 1975, any black man who dared to walk on any sidewalk in Geneva was “picked up” by the Geneva P.D. as ‘a “suspicious person'” simply for being there. This included a black gentleman who had been recovering from an accident as a patient in the old Community Hospital on Third Street. Seems he was walking the two blocks to the railroad station to go back east to one of the other suburbs when a Geneva cop decided to “detain” him. Having lived in the area all my life, with a cousin who had been in the Geneva P.D at that time, I give the story credibility. At that time, people of color were not welcome in Geneva. This was not a problem in Batavia, where some black families have owned property even before the Civil War.